← What happened to a free Australia? 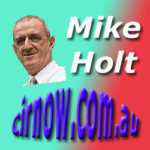 Posted on July 12, 2018, in Broadcasts and tagged Australian Patriot Radio, Harry and Mike Oz Chat, people power, Podcast. Bookmark the permalink. Leave a comment.